Migrant workers to strike across London got their first victory mere hours into walking out, as Kensington & Chelsea bring the services back in-house. 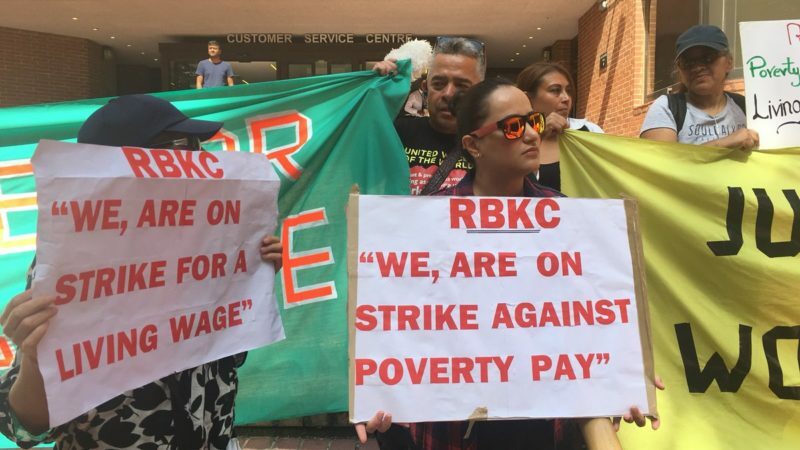 Cleaners at the the Royal Borough of Kensington and Chelsea (RBKC) had only been on the picket line for a few hours when they received the news: the council conceded, and cleaning services will be brought in-house. The move followed a historic strike, taken place simultaneously at the Ministry of Justice and RBKC, with the support of cleaners at Health Care America. RBKC cleaners are employed by service giant Amey, who had not been paying them a living wage or sick pay. “Kensington and Chelsea council always seek to get value for money for our residents and taxpayers, to which we are accountable. We are not prepared to pay more for a contract with a private sector company which has a turnover of billions and which clearly clearly has the resources to pay staff appropriately. The workers’ union, United Voices of the World (UVW), celebrated the early victory with a series of tweets and pictures of the picket line, which turned into a festival of solidarity, with workers from other strikes present. The migrant cleaners’ struggle has also gathered support from several politicians, including the shadow justice secretary Richard Burgon and the Green Party co-leader Jonathan Bartley. Burgon was pictured standing with cleaners at the Ministry of Justice. All too often forgottten. All too often ‘unseen’ by ‘the great and the good’. “Cleaners bravely striking for their rights today have made history in the fight against the exploitation of low-paid workers. It is shameful that the Ministry of Justice doesn’t pay its cleaners enough to live on. In this age of insecurity Government departments should be leading by example, not leaving their own cleaners without basic workers’ rights. The strikes will continue tomorrow and Thursday, while the cleaners at Health Care America will also be taking industrial action at the end of the month.